Vintage Carpenter Reed Organ, ca 1910- Best Offer Accepted! A beautiful antique reed organ which still plays! (Three keys need new reeds). This could be a great addition to a home where vintage furniture is prized. The beveled mirror is in excellent condition, the detail work on the cabinet is stunning, there are no problems with the veneer. 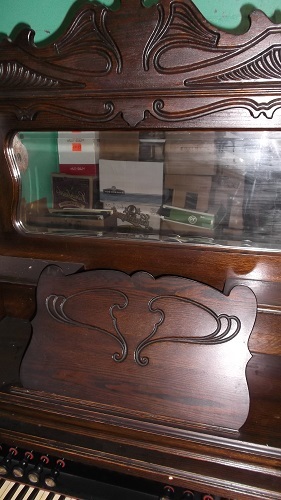 This piece has not been refinished, but still has its original look. Own literally a blast from the past! Built by the Carpenter Co. in Brattleboro , VT, this is a piece of American history. Delivery negotiable, will entertain best offer.